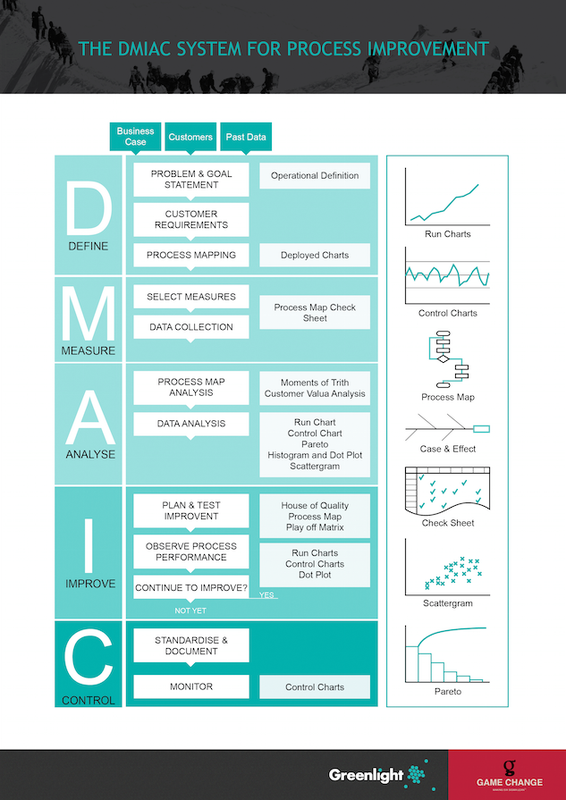 The Six Sigma DMAIC Roadmap is more than just a measurement scale and the application of statistical analysis tools. Centered on a disciplined problem solving method, Six Sigma has evolved into a powerful business philosophy and an instrument for driving cultural change. As is the case with Lean, Six Sigma also relies on the application and deployment of best management pratice in a structured manner. Define the Project, the Customer Requirements (CTQ) and Map the Process at a high level. Define the Measure, establish a valid Measurement System, collect the data and describe the distribution of the process data. Determine the Process Capability and identify and validate root causes of variation using Statistical Tools such as Hypothesis Testing, Regression Analysis and historical Design of Experiment. Develop and implement solutions using Creativity Techniques, decision making tools, Pilot testing, Design of Experiment and Simulations. Establish ongoing process controls to avoid the problem recurring by implementing Control Charts, assigning clear process ownership and documenting the improved work-flow. Each Lean Six Sigma project carried out within an organisation follows the defined DMAIC sequence of steps and has quantified value targets.